Some say Bacow’s history in higher education campaigns has prepared him well for the financial responsibilities that come with running one of the world’s richest universities. When Kirkland House administrator Kate D. Cavell was an undergraduate at Tufts University, she spoke to freshmen on the first night of pre-orientation. Later that night, to her surprise, she received an email from then-Tufts President Lawrence S. Bacow. Now Bacow—a long-time academic administrator—will once again have the opportunity to interact with Boston-area undergraduates in his capacity as university president. This time, however, those students live two metro stops south on the Red Line. Though Bacow was just announced as Harvard’s 29th President Sunday afternoon, his tenure at Tufts—as well as administrative roles at other universities—hint at likely leadership tendencies going forward. He will be the first Harvard President to have prior experience at the helm of another university since Nathan M. Pusey ’28, who led Lawrence University before being tapped as Harvard’s 24th President in 1953. In Bacow’s decade at Tufts, he, like Faust, conducted a capital campaign, weathered the 2008 financial crisis, and kept closely involved with undergraduate social life. Despite his years of experience, Harvard will present new challenges—but higher education experts and friends say Bacow has acquired the skills to face them. Former friends and Tufts students said Bacow’s tenure was marked by active, hands-on interactions with students as well as clear-eyed attention to undergraduate issues like student social life and freedom of speech on campus. Cavell called Bacow a “champion for undergraduates” and “a perfect pick” for Harvard. John S. Wilson, a member of Harvard’s Board of Overseers who served as Assistant Provost at MIT, said Bacow’s “humanity” as MIT Chancellor became evident when he visited MIT students after a classmate took his own life. In addition to one-on-one interactions with undergraduates, Bacow made several larger-scale policy decisions at Tufts on issues also relevant to Harvard. During his tenure, Bacow was outspoken on issues of free speech. Following racially charged incidents at Tufts—including a series of satirical articles in 2007 implying Muslims were violent and African-Americans were academically unqualified for college—Bacow advocated for freedom of expression and commissioned a task force that eventually created a university-wide policy on the issue. In the past year, Harvard student groups have sparked their own debates about free speech by hosting controversial speakers including sociologist Charles A. Murray ’65 and ex-pharmaceutical executive Martin Shkreli. Social life forms another issue that might follow Bacow to his new Mass. Hall office. Current University President Drew G. Faust has worked to limit the power of off-campus social organizations and re-center social life in the residential Houses; at Tufts, Bacow’s major social life interventions focused on alcohol consumption. In 2011, he ended a decades-long “Naked Quad Run” tradition at Tufts—akin to Harvard’s own Primal Scream—citing safety concerns with alcohol poisoning, physical injuries, and verbal clashes with law enforcement officials. Graduate School of Education Professor Richard Chait, who worked with Bacow at Tufts, said Bacow often personally intervened in the cases of undergraduate students transported to the hospital for excessive alcohol consumption. While Harvard is about to conclude a record-breaking $8 billion capital campaign, fundraising will likely remain a priority for Bacow, who completed a $1.2 billion campaign at Tufts in 2011. Wilson said Bacow’s history in higher education campaigns has prepared him for the financial responsibilities that come with running one of the world’s richest universities. In that campaign, Bacow doubled the endowment to over $1 billion for the first time in the university’s history. During his tenure, the Tufts endowment grew from roughly $600 million in 2001 to over $1.4 billion in fiscal year 2011. “If you double anybody’s endowment, you’re having a meaningful, history-making impact,” Wilson said. Current MIT President L. Rafael Reif said that Bacow “did a spectacular job fundraising” at Tufts. “One important thing about fundraising is that you have to understand people very quickly, you have to understand why they would be willing to give, why they give to an institution, and he’s very good at reading people and extremely good at understanding people,” he said. Despite Bacow’s success in fundraising, his plans were partially derailed by the 2008 financial crisis, which also constrained budgets at Harvard. In 2006, Bacow launched the Tufts campaign with the explicit goal of moving towards need-blind admissions. The need-blind policy, though, was suspended in 2009 as a result of financial constraints. Faust—the first female president of Harvard—made issues of diversity key to her tenure. While at Tufts, Bacow created the University’s Office of Institutional Diversity. He has also repeatedly discussed the importance of the contributions of immigrants to the country. He often mentions he is a child of immigrants himself. Wilson said Bacow also worked as a member of the advisory board under the Obama administration when Wilson worked at the White House with the Historically Black Colleges and Universities initiative. Several former colleagues said issues related to diversity are a priority for Bacow. Nonetheless, despite calls for diversity during the presidential search, Bacow will be the 28th white man to hold Harvard's highest office. Fellow higher education expert Thomas D. Parker ’64 said Bacow has a good record on diversity issues at his previous institutions, but will likely have to be particularly sensitive to them in his new role. Many higher education experts and former colleagues said Bacow’s adept management at past institutions will serve him well in his new role. 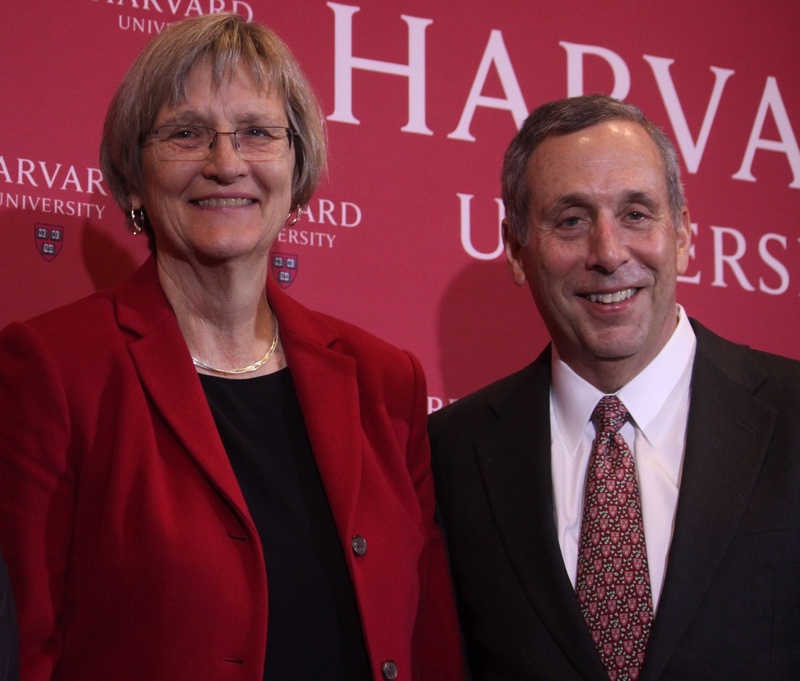 Chait said he was “ecstatic” when he heard Bacow would assume the Harvard presidency. Chait, a long-time colleague and close friend of Bacow, previously worked with him on the Board of Trustees at Wheaton College and served as an advisor to Bacow while they worked at Tufts. “This was an occasion where the best university in the world appointed the best president in the world. There’s delightful symmetry to the choice,” Chait said. Tufts professor and former Harvard Board of Overseers President Leila Fawaz, approached leaving a reception for Bacow held in Loeb House Sunday night, called his selection “a wonderful choice.” She said Bacow was well liked by “all the staff” at Tufts. Parker said Bacow’s “extraordinary track record” made him a clear choice for the presidency.